In April 2013, Amazon stepped decidedly into the world of original television programming when it streamed over a dozen pilot episodes for free and asked viewers worldwide to vote on which among them should get picked up. Out of that great experiment in participatory democracy came two new series – the Silicon Valley comedy Betas and Gary Trudeau's political comedy Alpha House – which both premiered in November and were only available online for Amazon Prime subscribers. (Alpha House, starring John Goodman and Clark Johnson, turned into the surprise highlight of this past fall's TV season.) Now, less than a year later, Amazon's "pilot season" returns, stronger and more confident than before. Amazon's second year may offer fewer "prime time" pilots than before (two one-hour dramas, and three half-hour comedies), but the productions are more ambitious, and come with some genuinely high-profile talent both in front of the camera and behind it. We have Chris Carter's apocalyptic thriller The After, the well-crafted crime procedural Bosch (adapted from Michael Connelly's popular series of novels), Transparent with Arrested Development's Jeffrey Tambor, Mozart in the Jungle set in the cutthroat world of a New York philharmonic orchestra, and The Rebels, a more conventional comedy about a failing professional football franchise. While each of the pilots has something worthwhile, the two real gems are Bosch and Transparent, which are easily among the most polished and self-possessed new shows I've seen in a while. Though I'm not entirely convinced that Amazon's "Help Us Decide" model is all that groundbreaking – ultimately, it all really comes down to a maxim TV executives have been following since Philo Farnsworth transmitted his first television signal: give the audience what they want. Still, it is ingenious from a marketing and publicity perspective. In this YouTube and low-cost digital video era, Amazon is giving its audiences the feeling of an inside track to the still mysterious world of television programming. (Last year, one of Amazon's offerings included an animated episode that was still unfinished, storyboards and all.) And with that, the viewing public gets a crucial early buy-in to new shows that haven't even yet gone into production, making us root for "our" show to get picked up. It's not altogether different – psychologically at least, if not financially – from the Kickstarter model adopted last spring by Veronica Mars' Rob Thomas, and the result is much the same: free publicity and a pre-invested audience. Still, technological and business innovations aside, at the end of the day it's either good TV or not. And fortunately for Amazon, they have found some winners this year. No word has been given as to how many of the five shows Amazon can afford to produce, but based on last year, it's probably at least two and at most three. All of which means that some of us will no doubt be disappointed by the results. I recommend taking the time and checking them all out yourself and voting for your favourites, but if you don't feel like investing in the full three-and-a-half hours, here is my two cents on what's worth watching. Adapted from Michael Connelly's most successful series of novels, Bosch tells the story of L.A. homicide detective Hieronymus “Harry” Bosch. The pilot was written by Eric Overmyer (Treme) and Connelly himself, and stars Titus Welliver (The Good Wife, Argo) as Harry Bosch. Joining Welliver is Jamie Hector (The Wire) as his partner Jerry, and Amy Aquino (ER) as his supervising Lieutenant. Told with measured restraint, there is a timeless quality to this show that is quietly powerful and genuinely refreshing. It's not merely that Bosch insists on driving a old model American sedan and seems resistant to most 21st Century niceties (like email and not smoking indoors), or that Welliver looks like the epitome of the hard-boiled detective in L.A.'s punishing rain, but the story itself lacks the sensationalism which has unfortunately become the norm in network crime procedurals. 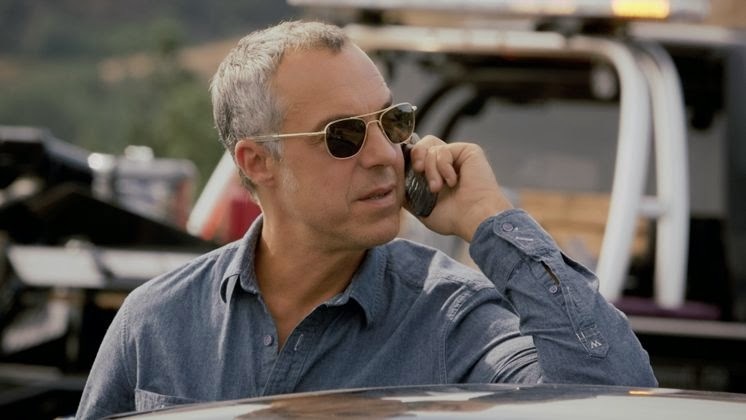 Bosch is a man of few words, and Welliver slips into the role of the obsessive police detective with no life outside "the job" as if he were born to it. At the centre of the story is the discovery of the skeleton of a murdered 13-year-old boy, but the goriest details are revealed with a simplicity and moderation that could teach Law & Law: SVU a thing or two about the inverse relation between volume and emotional impact. I can't speak to the show as an adaptation of the novels (though I am much more inclined to read them now), but Bosch is gripping and well-done television. It is always challenging to evaluate a television series from a single episode, and comedies especially, but in all sincerity Transparent won me over in the first five seconds. With its Husbands and Wives-era camera work, low-key piano soundtrack, and sheer self-assuredness, the pilot grabbed my attention and never let go. Created by Jill Soloway (showrunner for United States of Tara and writer for Six Feet Under), Transparent tells a grown-up family story, in all senses. The pilot introduces us to three adult siblings – Ali (Gaby Hoffmann, Girls), Josh (Jay Duplass, The Mindy Project), and Sarah (Amy Landecker) – who are more inter- and co-dependent than they realize. 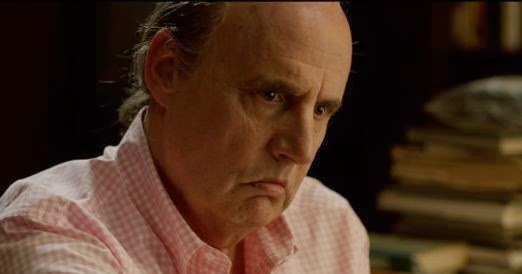 At the centre is Mort, their recently retired parent, played by a pony-tailed Jeffrey Tambor. Mort is going through some real changes (a key plot element may have already been spoiled for you by the show's publicity, but I won't reveal it here) and is struggling to re-involve his children in his life, but each of them is distracted by their own personal dramas. Their stories and characters unfold with sensitivity and patience and, especially surprising in this hipster era of cable comedy, without irony or self-consciousness. The pilot has the exquisite pacing of an indie film, and while each of the characters has their own quirks and off-centre sexualities, the camera reveals but never judges. (Even in this first 30 minutes, the camera is almost a character in itself, perhaps even the show's most innovative one.) Because of its half-hour format, Transparent will likely be labeled a comedy, but it is no dire need of a single label: it is simply excellent, by any standard or measure. While no doubt Amazon's most highly-anticipated pilot is The After, The X-Files' creator Chris Carter's first real return to television in over a decade, it was also the most disappointing and frustrating of what Amazon offered. The After follows the lives of eight strangers thrown together after a mysterious (perhaps global) event knocks out the electricity and throws Los Angeles into turmoil – and frankly, if it weren't for Carter's involvement I probably wouldn't have even gotten through the entire episode. There is little evidence in The After's first hour of what made The X-Files so ground-breaking. I don't want to have to say it – though I'm certainly not the first – but I'm becoming convinced that Lost has broken science fiction storytelling on television. The X-Files (in its early and middle seasons especially) is the forbear and gold standard for how to balance continuing story arcs with core characters and powerful standalone episodes. (If in its later seasons it began to falter, it was perhaps more for having to accommodate the comings and goings of its two stars than the weight of its established storylines.) But none of that narrative finesse is on display in this first hour of The After, which aims firmly down the middle of current (and ever weakening) pseudo-apocalyptic sci-fi fare. Long story arcs have become more commonplace in the years since The X-Files, but the best of those (as exemplified ironically by The X-Files itself) include a sustained emphasis on depth of character and their development, and a genuine respect for consequences and continuity. But when plot is reduced to riddle, and characters are just placeholders for puzzle pieces, the brain might be piqued but the heart wanders. In this first hour we get mysterious tattoos, coincidental birthdays, and some decidedly creepy looking aliens, but very few reasons to actually care about its world. Mozart in the Jungle is Jason Schwartzman, Roman Coppola and Alex Timbers' glimpse behind the curtain of a New York symphony orchestra. 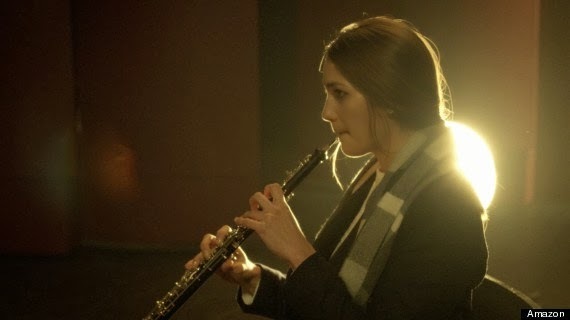 Though the pilot boasts some impressive guest appearances by Malcolm McDowell and Bernadette Peters (and even a cameo performance by violinist Joshua Bell), Mozart's lead character is Hailey (Lola Kirke), the young oboist who falls into the orchestra just as a new upstart conductor (Gael García Bernal) begins to shake things up. Hailey is still new enough to the scene to worry about "her art", and is taken under the wing of Cynthia, an older and more hardened cellist played by Saffron Burrows. Mozart's pilot, directed by Paul Weitz (About a Boy), looks and sounds great, but aside from woodwind-based drinking games, the story didn't offer very much that felt new and compelling enough to compete with Transparent for a coveted slot in the fall. The Rebels (starring Justified's Natalie Zea) is a more traditional single-camera sitcom about a young widow forced to take over as owner of her husband's professional football team. The show, with the requisite complement of quirky characters and intermittent insight into the ins-and-out of professional football, is also wholly watchable. Josh Peck as Danny, team-gofer-turned-General-Manager, brings a lot of heart to his role and is easily the standout character so far. But the rest of the episode doesn't quite seem to know whether it's a show about the travails of a young widow forced to raise her adolescent son while mourning his recently deceased father or about a coked-up monkey with a loaded gun who shoots up a Hollywood party. In the end, the pilot wasn't nearly raunchy enough or touching enough to find its voice. Also, considering how strong its competition is, The Rebels is almost assuredly the one guaranteed casualty of this process. If however you do want an over-the-top football-based TV comedy which happily includes bawdy tales of drugged up zoo animals, I heartily recommend Spike TV's now-cancelled Blue Mountain State. 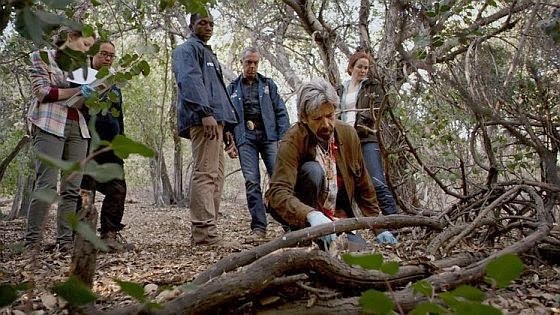 Only time will tell for certain which of these five new series Amazon will pick up, but if we're lucky we'll see full seasons of Bosch and Transparent begin airing in the fall. (I also anticipate The After will also get the nod, purely because of the Chris Carter factor.) While the two series could not be more different, they both share a maturity that makes them utterly compelling television – which fortunately is also precisely what Amazon wants and needs. The goal here after all is to give people a reason to subscribe to an entirely new service by offering television they'll want to see now, and not to wait for an inevitable DVD release. (This is what HBO have been doing for over a decade, and what Netflix seems to have done by creating two of last year's most talked-about series, House of Cards and Orange is the New Black.) On those terms, Bosch and Transparent more than fit the bill.